Here’s an interesting development. The HMS Investigator, a rescue ship abandoned in the ice in 1853 while in search of the doomed Franklin expedition to find a northwest passage thru the arctic, has just been discovered again, mostly intact. What does this have to do with the president’s desk? Another of the rescue ships was HMS Resolute, which rescued the crew of Investigator before itself being trapped by ice and abandoned. 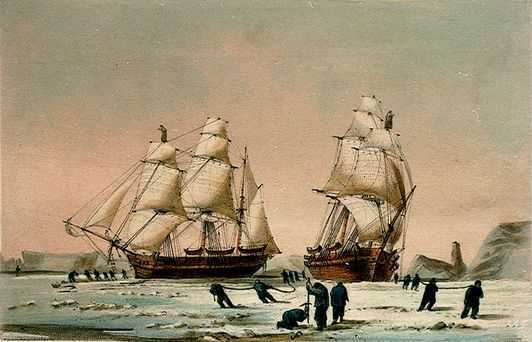 But the Resolute was found two years later in an ice floe by whaler USS George Henry. She was purchased by the US government, refitted, and returned to the UK as a gesture of courtesy. When Resolute was retired in 1879, the British government, in appreciation for the American efforts and ongoing friendship, had part of her timbers crafted into a large partner (that is, two-sided) desk for President Hayes as well as a lady’s desk for the widow of Henry Grinnell, an American who had privately funded part of the search for Franklin, and another used aboard Queen Victoria’s yacht. The presidential Resolute Desk has occupied the president’s office or study in the White House for nearly all the time since its gifting in 1880. It would be interesting to see Investigator restored and refitted, perhaps with some of her timbers removed and made into something else. Claire McLean of the Presidential Pets Museum wrote to me a couple of days ago mentioning that she’s looking for someone to take over her Presidential Pets website. She’d like to retire from it but not simply let it whither. It’s a great site but not one that I’d want to take over myself. No front page change this month. I’m on vacation.